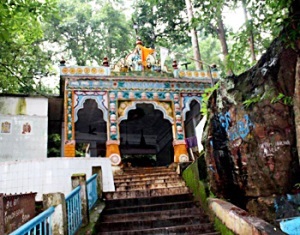 Gupteswar Cave is a city shrine dedicated to Lord Shiva. It is a world-famous pilgrim site situated about 55 km away Jeypore, Koraput District in the state of Odisha, India. It is a limestone cave discovered some time ago and has a number of scenic spots around. The main attraction is the gigantic Shiva Linga which is said to be increasing in size. Pilgrims from all over the country come here during the Sravana period, because the yearly BolBom yarta is held in this place. Devotees walk to the Gupteshwar during BolBom yatra to bathe in the maha kund, and then chant near the Shiva Linga. The cave is more or less like the Bora caves ( India - Odisha and Andhra border ). you have got same feelings in other natural places . But this Gupteswar cave is special for the underground water and the view of Davis fall from the farthest end of the cave . It is really worth seeing. It is a natural cave with Stalagmites. One has to reach the end to view the superb scene .The temple houses a sacred swayambhu Shivling called Gupteswar, which literally means the ‘Hidden God’. Shivratri is the major festival celebrated here amidst much pomp and splendor.